Speakers are major part of any sound system as they act as the sound outlet in the system. Their placement plays a critical role in the final sound output. This will require that the speakers to be placed at a certain height and this is a where the speaker stands comes in. A good set of these stands helps to reduce vibrations in the sound output, makes the bass more tight which means better and clearer sound. In addition, they are durable accessories and their stability helps to improve your speakers’ lifespan. With that in mind, we have compiled the best speaker stands for every budget to guide you if you are planning to invest in a stand. With these, you can be assured of great broadcasting regardless of your sitting position and at the same time secure your speakers for many years to come. Here is a summary of the products key attributes. Sanus HTBS comes in a sleek and very slim design which makes it fit in even awkward places like behind a TV stand and it is the perfect choice for small speakers mostly bookshelf and satellite speakers. Additionally, it is compatible with most speakers thanks to its adjustable height making it easy for you to pair it with brands like Sony, Polk among others. Rubber feet and spikes for stability- Sanus HTBS comes with either rubber feet or spikes for better stability in hard floor and carpet floor respectively. The feet are made of cast iron which helps in reducing vibrations leading to superb audio production. In addition, the feet are padded to prevent the stand from scratching your wooden floors. Inbuilt wire cable channel- This stand has an integrated wire management system that helps you to tuck in all speaker cables without much effort for that clean and attractive look. This also helps to provide a safe working area free from accidental slips and falls as well as keeping your room clutter-free. Multiple speaker placement options- With adjustable height of 28 inches to 38 inches, this stand offers you three ways in which you can mount your speakers on. You can set them on the top plate, on the keyhole adaptor or on the L-shaped brackets with all positions aiming at delivering an optimal performance by positioning your tweeters at the ear level. With this, you can fit your satellite and bookshelf speakers of any size. High-quality construction material- Sanus HTBS entire body is made from the heavy duty gauge steel which means; (i) It will last for many years as compared with its wooden counterparts, (ii) The steel is capable of absorbing unwanted noise and vibration resulting into clear audio, (iii) And lastly, the stand can be used as additional furniture in the room. Our verdict- Sanus HTBS is an exceptional set of speaker stands on the market which comes in a simple design yet long-lasting. It gives you the option to customize the height ensuring best sound output while at the same time it enhances the beauty of your house. Pick a set of these adjustable speaker stands for a total transformation of your surround sound. This easy to mount satellite speaker stand is very stable and it comes with all the necessary accessories and hardware making it easy for you to set it up without much hassle. It has multiple mounting positions which mean that you can use this stand with a number of speakers that require different configurations and it allows free movement to accommodate different sitting positions. Sound customization through adjustable height- With PERLESMITH PSSS1 you can customize the sound of the audio by simply manipulating the extendable tube to achieve the desired height. It offers a height range of 30” to 45” allowing you to enjoy the surround or stereo sound as you desire. Solid triangular base- PERLESMITH PSS1 comes with a sturdy triangular shaped base which is built by heavy-duty iron cast making it stable than no other. With this construction, the stand can support speakers weighing up to 8lbs on each side. The base feet offer you two options to prevent the stands from sliding. For cemented/tiled and wooden floor, you can attach the provided rubber pads while for carpeted surfaces the provided nuts come in handy. Unmatched wire management mechanism- For those who don’t like to see speaker wires and also as a safety precaution, PERLESMITH PSSS1 has upgraded its wire management mechanism by widening the diameter of the stand column so that it can fit as many cables as possible. The column is divided into 3 parts to enable the wires to slide in easily. Three mounting options- PERLESMITH PSSS1 provides three different mounting configurations enabling you fit quite a wide range of speakers. They include the L- shaped bracket with a vertical hole for fitting speakers in a vertical position, the keyhole adapter for horizontal placement and the top plate orientation for speakers without mounting holes. Our verdict- PERLESMITH PSSS1 is a set of very stable speaker stands, easy to set up and the good thing is you can move it from one place to the other without much hassle. It comes with everything you need for installation; enough reason for you to consider this stand for your speakers. Buy PERLESMITH PSSS1 on Amazon for a good deal. Vivo SP03B comes in pairs and they are designed to blend into any décor with almost universal compatibility. They come with a standard height enabling them to hold your speakers at the ear level all geared towards enhancing your audio experience. The featured spikes at the top plate and at the base play a major role in minimizing the level of vibrations resulting into clearer sound effects and music. Universal Compatibility- VIVO STAND-SP02B is designed to fit with any speaker from bookshelf speakers to satellite speakers from the most known brands to those that are yet to make a name for themselves. Its large top plate is capable of supporting the biggest speakers out there not forgetting that it is very cost friendly. Premium appearance- These speakers comes in a pair with aluminum and glass tempered pillars. This gives them a robust construction with a glossy black finish that makes them fit into any décor while helping your speakers project the most desired audio. Their sleek design makes sure that the stands will not take much space in the room. Reliable foundation- VIVO STAND-SP02B has been designed with careful consideration of the placement surface. Its foundation makes sure that it does not scratch or damage the surface. The removable spikes gives the stand a firm grip when placed on a carpet which can be replaced with the rubber pads when you want to change the position and place it on a hard surface. Internal cable management- With the VIVO STAND-SP02B you have the option to keep the speaker cords and the power cords out of sight internally. With this, the place looks well organized and safe to move around. Our Verdict- With universal compatibility you can’t afford to take your eyes off this set of compact speaker stands with great features yet it comes at a very affordable price. 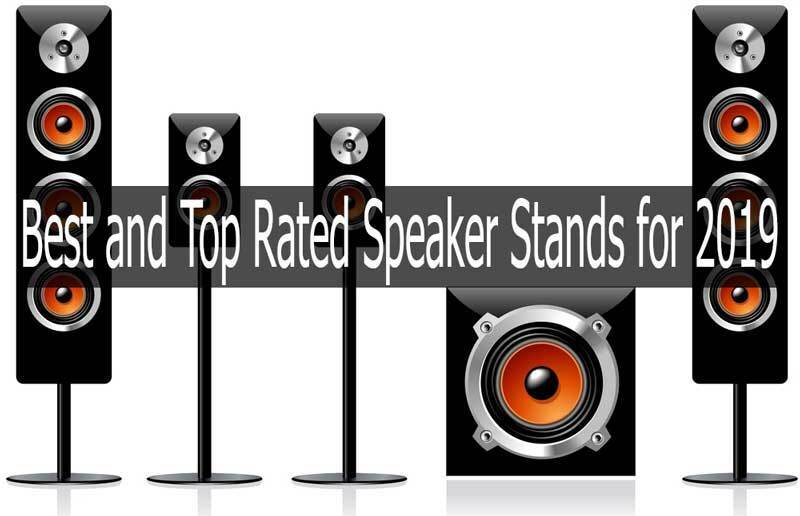 Are you on budget and looking for quality speaker stands to elevate your surround sound? Try VIVO STAND-SP02B for a completely different listening experience. The Atlantic Satellite 77305018 features a three- feet base which makes it a good choice for a set of heavy speakers. It is easy to set up and its ability to adjust the height to make it fit different listening positions or different brands of speakers makes this stand very flexible. The cables are concealed for a safe operating environment and neat appearance. Three-legged base- Atlantic Satellite 77305018 features a three-legged base which is also wide enough to provide the required stability to keep the speakers in position even the speakers’ volumes are pushed to the limit. The fitted rubber pads keeps the stands from sliding when placed on a slippery surface. Easy to use- The speaker stands comes with mounting brackets which help to make the process of setting them up easier. You can play around with the height anywhere between 27” and 48” until you get the height that you deem perfect and you can fit them with speakers of up to 5lbs on each stand. Durability aspect- Atlantic Satellite 77305018 has been designed with durability in mind. Its poles are made of the durable cast-iron with a great black finish that makes it stand out. This sturdy makes sure that it does not topple from accidental knocks. Additionally, it is lightweight to ease movements. Great wire assembling system- The stand pole is wide enough to accommodate all cords making the entire setup look like a wireless system. All you have to do is to tuck the cords inside the pole and with this, you are less bothered and also it adds to the decoration of your room. Our verdict- This black-themed pair of speaker stand blends quite well into any décor and their strong and durable construction makes them a perfect choice for both small and large speakers; and the result is a pleasing sound that is free from vibration. Get Atlantic Satellite 77305018, perfect for long-term operation. Sanus WSS2-B1 is specifically designed for both the SONOS PLAY I and PLAY 3 set of speakers and it comes with three mounting brackets (one for the PLAY 1 speaker and two for PLAY 3 speakers). For the PLAY 3 speakers, you can either mount them in a horizontal or vertical position. The stand post is hollow and you can keep the speakers’ cables in there for uncluttered and clean appearance. Designed for SONOS play 1 and 3 speakers- Sanus WSS2- B1 is specifically designed for these Sonos speakers. This stand always elevates these speakers at the specified angle and the result is smooth bass response and unmatched sound clarity. Three mounting brackets- As mentioned earlier, Sanus WSS2-B1 is only compatible with Sonos play 1 and 3 speakers and as such it comes with three mounting brackets; one is meant for play 1 speakers while the other two is for play 3 speakers that are aligned vertically and horizontally. This means that you can align the play 3 speakers in either position. Anodized aluminum construction- Sanus WSS2-B1 boasts of one of the strongest construction with an anodized aluminum pole which not only provides durability but also it adds some sense of style. Cable-hiding ability gives a sleek and uncluttered design and they are perfect for any setup from home theatre setup to surround sound systems. In addition to this, these stands have been UL-listed and they are also safety certified. Customized for any flooring surface- With Sanus WSS2-B1, stability is assured no matter the type of floor. The included spikes which can be interchanged with rubber pads make sure that you are limited to any flooring surface. Our Verdict- For your Sonos PLAY 1 and 3 speakers, look no further. Sanus WSS2-B1 is designed for these speakers, complimenting every aesthetic all working toward achieving perfect audio production. Fit your Sonos speakers on these stands today and notice the difference. This is one for the best speaker stand for budget users with amazing features which includes solid steel construction and adjustable height and width. This means that you don’t have to worry if your speakers are a bit wider than the ones you had previously. The adjustability aspect doesn’t stop here; VideoSecu 2 features an adjustable top plate whereby it allows you to tilt it at a certain angle to fit different presentations. Side clamping and adjustable top plate- VideoSecu 2 has a special feature that enables you to adjust its width to about 11” which means that it can comfortably handle large surround speakers or bookshelf speakers with such width. With this, you don’t have to worry if your speakers are wider than the rest. Ability to pan the top plate at 180 degree- Unlike other stands, VideoSecu 2 can be tilted at an angle of 180 degrees enabling you to have full control of the presentation. For level adjustment, the stand can further be tilted at -/+ 10 degrees until the desired level is attained. The height can also be brought up to 47 inches and down to 26 inches as it is desired. Improved stability- Good balance and stability is crucial in ensuring safety for both the speakers and the user. VideoSecu 2 is built with heavy-duty steel and a solid base which offers broad support and makes the entire setup stable even with large and heavy speakers. Stylish appearance- Coming in a glossy black finish, VideoSecu 2 adds to the decoration of the room and the rubber feet keep it leveled on the floor. All unsightly cables are concealed through its wire management system for clutter-free appearance. Our verdict- If you are looking for heavy-duty speaker stands that are stable enough to support your heavy speakers, then VideoSecu 2 is a sure try. Mounting your speaker is easy and the fact that you can adjust the height makes sure that the speakers are placed at the best position possible. Check and buy VideoSecu 2 on Amazon and optimize your listening. Pa Speaker Stands are great speaker stand choice for your loudspeakers and other set of speakers. Featuring three legs and adjustable height, these stands are quite stable and are capable of holding speakers of up to 100lbs in place. They are compatible with a number of speakers leading to great performance making them worth every penny. Designed for stability and durability- PA speaker stand features collapsible tripod legs strongly built for durability and the collapsible legs ensures maximum portability. With this construction, the stands can support speakers of up to 110lbs. The legs feature non-slip features which provide firm attachment on various surfaces. Cable tie straps- These stands come with 8 cable tie straps which provide a convenient and very cost effective way of organizing the cables as one strap can bundle 50 cables. All you have to do is run the wires through the loop and fasten via the provided attachment and the result is a professional and neat setup. Multiple height adjustment levels- It features a sturdy column which provide five levels of height adjustment that ranges from 44”- 70” holding yours speakers safe and in place enabling you to settle for nothing less than the best sound production. Each height level has pre-drilled holes and all you have to do is to fit the top plate with locking pins when the desired height is achieved. Easy to mount speakers and incredible compatibility- PA stands are compatible with various speakers and the process of mounting the speaker is quite easy. You only need few tools to secure your speakers off the ground and deliver the sound to your crowd. Our verdict- Pa speaker stands guarantees you great performance through their sturdy legs that hold your speakers safely and in place at all times. They are compatible with many speakers thanks to their adjustable height and huge weight bearing capacity. Research no further, Pa speaker stands has all your listening needs covered. Bose UFS-20 comes in sleek design with great white and black finishes which blends easily with the rest of the sound system setup and its metal casing makes this product highly durable. Additionally, these cube speakers stands has unbreakable steel frames which do not get damaged over time and their slim design makes sure that they don’t take a lot of space in the room. Compatible with almost all Bose Entertainment system- At a fixed height of 38” Bose UFS-20 is compatible with most 2- speaker and 5- speaker systems from Bose. The only disadvantage here is that it only supports Bose entertainment systems limiting your use with other speaker’s brands. Saves a lot of space- Bose UFS-20 are slender metal stands that take very little space, freeing some space for other necessary furniture. These slender stands display your speakers in an elegant way while at the same time hiding all unsightly wires and eliminating slip hazards. Heavy-duty steel construction- Bose UFS-20 is designed in a durable and long-lasting construction which made possible by features such as heavy-duty steel that is used to make its frames which do not break no matter the amount of pressure exerted. It also has one of the most solid base that serve for many years. Elegant design- Available in both white and black finishes, these stands are designed to blend well into any décor adding a touch of style to your room but most importantly it is designed to optimize your listening experience to a level no other can. Our verdict- The Bose UFS-20 is a good choice for your cube set of speakers and it comes with a stunning functionality and unique design available in two colors for aesthetic appeal. Bose Entertainment never disappoint, don’t hesitate to pick our Bose UFS-20 on Amazon today. Rockville RHTSB is designed to hold your bookshelf and surround speakers into place with performance, appearance,and quality being the center of attention. This stand has also being widely used with most studio monitors making them really flexible. Its body is embellished with high-quality furniture paint that does not chip or crack over time. Tested and proved performance- Rockville made RHTSB with performance as their center of attention. They tested the height at 36” and established it is at this height that the stand delivered optimal performance. The stand also looked attractive at this height, hence they settled at this height as the fixed height. Hollow body design- Rockville RHTSB 36" comes with a hollow body whereby you can fill it with sand or any other material to add its weight and make it more stable. These stands have a load capacity of 60lbs which means that they can comfortably support heavier speakers without compromising the stability. They are sturdy enough to out-perform close competitors. Engineered for any floor surface- Worry less about the stands’ stability on any floor surface thanks to the rubber spikes and isolations pads that creates a non-slip surface that ensures optimal performance at all times. High-quality construction and premium finishing- Rockville uses only quality wood in the construction of RHTSB which helps to minimize resonance. In addition, it is embellished with high-grade furniture paint that does not peel even when exposed to harsh conditions. Our verdict- For your surround speakers, bookshelf speakers and also your studio monitors, the Rockville RHTSB present a perfect choice considering the fact that it was designed with quality and performance as the center of attention. Rockville RHTSB 36” is a masterpiece and it beats its competitors on their own game. Try it today. These are heavy-duty speaker stands and they comes with all the necessary tools and mounting instructions and all you have to do is to mount your speakers on them just as the name suggests. Their hollow glass and aluminum tempered column can be filled sand to increase stability while at the same time reduce floor distortion. Aluminum and glass tempered poles- The top plate and the support poles have been coated with about ¼ inch of aluminum alloy and thick tempered glass which gives the stands a sturdy construction. The stand can support speakers of up to 22lbs making them compatible with most speakers under that weight category. Empty center pole- Just like Rockville RHTSB, these stands also has a hollow center pole which can be filled with sand to improve stability and minimize resonance as well. The pole can also be used to hide the cables out of sight. Sleek and compact design- Mount-It! MI-58B comes in a contemporary design that uses high-quality materials for that stylish look for your loudspeakers. The black silk finish fits well into any interiors and the compact design makes it easy to carry it from place to the other as well as fit in tight spaces. Floor protection features- With Mount-It! MI-58B comes with spikes and rubber pads for proper mounting on all floor surfaces. You will be required to protect your floor as you will be using this stand for a very long time. With Mount-It! MI-58B, the poles tends to protrude past the bottom plates and as such you will be required to put the spikes on even on a hard surface. You can, however, cover the spikes with rubber pads to prevent the spikes from scratching the floor. Our verdict- Mount-It! MI-58B provides you with a way to optimize your listening experience in a way that it keeps your speakers secure and in an elegant way and at a great value. Mount-It! MI-58B is a great addition to your sound system. Check it on Amazon. This is the surface where the speakers will be fitted. Normally, the top plate will have some rubbers pads, holes or studs that facilitate easy installation. Most stands come with the rubber pads as apart from them providing a firm grip; they also minimize speakers’ vibrations. Those that features the studs are do not provide a firm grip as the former but they enhance the overall appearance of the setup. The last option is those that have holes whereby you will need to use screws to bolt the speakers into place. All in all the speakers need to be securely fastened so as to improve the speakers’ stability and consequently the sound quality. The base of the stand will vary from model to another. However, the wider the base the more the stable the stand is. A wide and heavy base ensures that the stand does not fall easily when it is knocked accidentally and it is the perfect choice for big and weighty speakers. It is also important to consider the feet of the base. The feet are; either rubber pads which are ideal for a normal flat floor or spikes if the stands will be positioned in a carpeted surface. Sound projection will majorly depend on the height of the stand which is why it is important to factor height of the stands. The ideal height level will the ear level which will fall anywhere between 20”-28”. The good thing is that some model comes with adjustable height which allows you to adjust the height to your convenience. This allows for flexibility and you are able to play around until you get the best audio output. Apart from stylish looks, the stands need to have a durable construction so as to ensure maximum stability and that the speakers are secure all through. Depending on your personal preferences and budget, the stands are normally made of wood, steel, and MDF. The wood and MDF stand are less expensive but they still hold the speakers as expected. The steel stands are relatively expensive and on top of offering maximum stability, they have an appealing appearance and they last for many years. Just as with the height of the stand, it is important to consider the maximum weight bearing of the stands as buying a lightweight stand will make your speakers run the risk of wobbling and consequently falling off. The stands should comfortably bear the weight of your speaker and it is recommended that you buy stands whose weight limit exceeds that of the speakers’. Most people prefer that the setup should have some mechanism of hiding the cable for tidiness and safety purpose. Most stands come with a channel for hiding these cables especially when the cables are too long providing a clean and safe operating environment. However, you can always leave the cables exposed it that’s what you prefer. Have you been looking for a way to improve your sound experience in the simplest way possible? Then a good pair of speaker stands will go a long way especially when it comes to minimizing vibrations that would otherwise lead to sound distortion. This is in addition to giving your speakers a longer lifespan and a decent appearance as well as facilitating easy movements. This is why this guide has clearly highlighted key models to help you settle on the one that is perfect for your set of speakers. These stands are for every budget and we recommend that you pick any of the model highlighted l above as they are of high quality and they will serve you for many years to come.